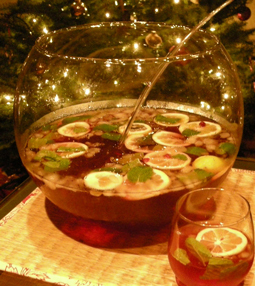 Chardonnay Pomegranate Punch - A recipe from Savor California, the online showcase for extraordinary gourmet foods and beverages from California. Pour soda and juice over ice in punch bowl. Mix in lemon slices, pomegranate seeds, and mint leaves. Makes 12 servings. Double the recipe for a larger crowd!